It's Irie: Going “Pacific” or Staying “Caribbean”? When Mark and I were in Belgium and the US this past summer, many people asked about our (sailing) plans. With my big mouth, I was proclaiming everywhere that we might go to the Pacific. It just seemed like the next, logical step in our cruising lives. Mark brought the subject up as well, but with a bit more caution. He had obviously not made up his mind yet and merely started thinking about the idea. To me, all safe and sound in comfortable, stable houses and fair weather – thousands of miles removed from our floating home in Panama – crossing the Pacific Ocean and exploring its tropical and exotic islands sounded like the perfect thing to do next spring. Now we are back on Irie, relatively close to the entrance of the Panama Canal, and the Pacific topic is “hot on the stove”. The discussion has started in earnest and pros and cons are weighed. Being on the bouncy boat again, with limited supplies, and thunder and lightning storms almost every night (meaning a lack of sleep), the concept of long ocean voyages sounds a bit less exciting and the thought of spending our boating life in flat anchorages with provisioning opportunities appeals, well, a bit more. Reality has set in and we are now faced with the apprehension of leaving everything behind that we know and plunging into a whole new world. In the past, we both had a relatively easy time making decisions about our next destination and we pretty much were compatible. I’m sure we will at some point figure out what’s next, but this time it is a bigger deal. Once we transit the Canal and make our way west, there is no turning back. We are gaining information about Polynesia – reading cruising guides and sailor’s reports – every day, and during cocktail time, it is our favorite topic. Although we have to take a break from it all every few days, because we are not making much headway in regards to an actual decision. Luckily, we still have a few months to make up our minds. Pacific Cons – What holds us back? 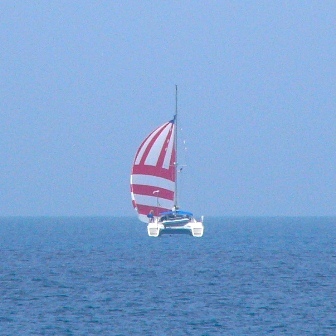 - Irie is a very light and small boat to battle big oceans. - We have weight limits - we can’t stock up our boat as well as monohulls, meaning expensive shopping along the way. - We have small tanks for water and fuel and will have to somehow store extra in jerry cans, which is where the weight limit comes into play again. - The first segment to the Galapagos Islands is about 10 days, the second one to the Marquesas, about 30 days (here we are a third of the way to, say, Australia), then there are day hops and week hops further west. Irie’s longest trip so far has been two days and two nights – close to civilization! - I will get (hopefully temporarily) seasick, especially in the typical following seas. - Our instruments and – most importantly – our autopilot are 15 years old and bound to break at some point (spares for these cost thousands of dollars and are not usually carried). - All the books and stories we read about the islands in the Pacific mention how hard it is to anchor in most places (deep anchorages, bad holding, dangerous cuts into atolls, uncomfortable swell rolling into the bay, coral heads strewn over the bottom, anchor chain wrapped around coral – diving equipment needed to rescue the anchor) and how inefficient and time consuming the checking in and out procedures are. (Imagine you arrive after weeks at sea, all shaken up and tired. It takes hours to set the anchor(s) satisfactory, then it takes half the day to check in and next, you have to leave that same anchorage to another one 100 miles way, because the swell is tossing you out of bed!). - Getting supplies and provisions is difficult and expensive. - Fresh water and fresh produce are hard to find; a water maker is out of our budget and interest. - We are leaving some of our favorite cruising friends behind. - We will be in an area far away from our home countries, family and friends. - There is no turning back, but it is possible to head back to the West Coast of the US through the higher, and less settled, latitudes. - The worry that “something bad” happens on one of the long passages – you are literally in the middle of nowhere. - The water temperature is colder and the tides in Panama City are “massive”. - We need extra (expensive) equipment on Irie for a trip of these dimensions. - Getting the boat ready, transiting the Canal, the need of more diesel and stopping at the Galapagos Islands will set us at least an extra $5000 back than staying in the Caribbean. - It will take some time and effort to prepare our boat and ourselves. Pacific Pros – Why do we want to go? - It’s time for something new, after spending five years on this side of the Canal. - We (me) are ready – mentally and physically - for a different adventure, new sights, new cultures and new experiences. - Irie is in pretty good shape. - We said “goodbye” to friends and family for a while. - We don’t have responsibilities that prevent us from going. - We will meet up with some of our other favorite cruising friends. 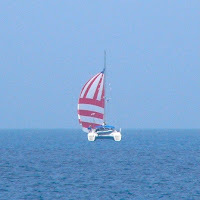 - We (me) are looking forward to experiencing a long time in peace and quiet on the big seas. - I am thrilled about all the wildlife we will get to see and the great snorkeling that awaits us. - The Pacific – hence its name – is a peaceful ocean and enjoyed by many sailors a year. - The weather is generally speaking enjoyable and benign. - We will have devices to alarm people if anything serious goes wrong. - Polynesia (and Melanesia and Micronesia) is best visited by private boat, and we have one now, so we should take advantage of it! 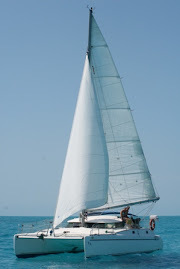 - Australia and New Caledonia are good markets to sell a boat, especially a catamaran. - Our friend Axel, who is in the Pacific right now, wrote us that the guidebooks are very conservative and outdated, and that anchoring and dealing with officials is easy and straightforward, most of the time. It is incredibly awesome there as well, we’ve heard. - Axel also says it is possible to find fresh water and produce – you just get it whenever you can. - Many cruisers (some of which we know) have done this trip before and thoroughly enjoyed it – some call the Pacific islands the highlight of their circumnavigation. - We have time and energy for a new, big project. - It all sounds like such an exciting adventure! The Pacific Ocean is the biggest ocean in the world and stretches over thousands of miles between land masses and continents.